HOCKINSON — After a whirlwind of a weekend (April 12-14), Hockinson High School’s musicians brought home a treasure trove of awards. “This is one of the most successful weekends I can remember for our program,” said Hockinson High School Band Director Corey McEnry. 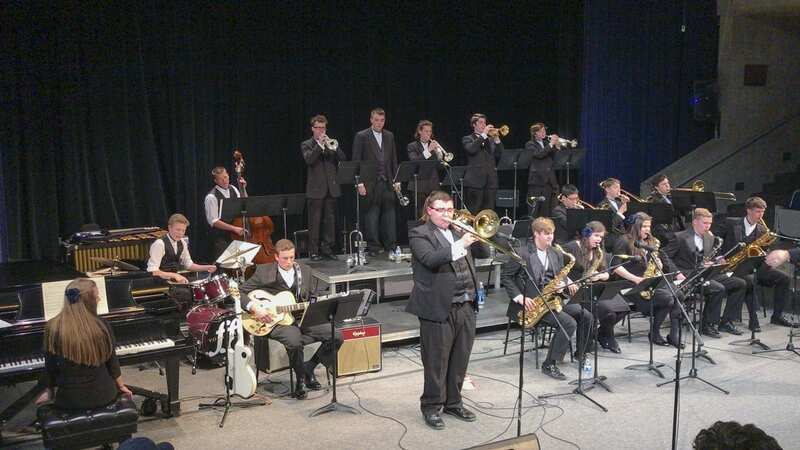 On Thursday, the Hockinson Jazz Band won first place in its division, plus first place in sight reading at the University of Portland Jazz Festival. Trombonist Riley Lyons won the award for best soloist. On Friday, the Wind Ensemble received a gold medal at the Columbia Basin College (CBC) Band Festival in Pasco. One judge called theirs “the most captivating performance of the day.” Flutists Liz Lindsley and Rebekah Soft were both recognized for outstanding solos. On Saturday, the Jazz Band won first place in its division of the jazz portion of the CBC festival. Trombonist Riley Lyons and drummer Erik Hawkins were recognized for outstanding solos, and the rhythm section — Zeke Dodson on guitar, Briell King on piano, Isaac Zora on bass and Erik Hawkins on drums — and the sax section — Olivia Gaines, Sydney Henwood, Jack Broer, Tanner Linton and Brian Schauer — were named outstanding rhythm and saxophone sections for the AA division. The band also was one of three out of more than 30 selected to compete for the Sweepstakes Award, the best band of the entire festival, regardless of division. Hockinson did not win this match, but it was an honor to be nominated alongside the winner, Mead High School of Spokane, and Hanford High School. Hockinson also won the Outstanding Instrumental Department award for the AA division, an award given to the school with the highest combined scores for Jazz Band and Concert Band. Hockinson has won this award four times — in 2009, 2013, 2016 and 2018.